This gallery features white country kitchens that are bright and inviting. Country kitchen designs are great for those who want to spend time with friends and family. They often have layouts that allow for eating within the kitchen at a breakfast nook or dining island. 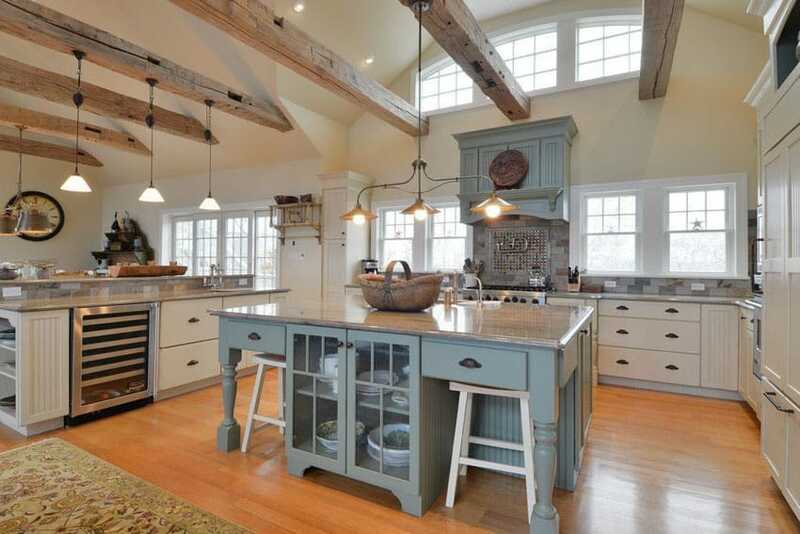 Country kitchens are warm and showcase handcrafted furniture, and natural materials. We hope these country kitchen ideas we give you inspiration for layouts and decor to create your own perfect space. 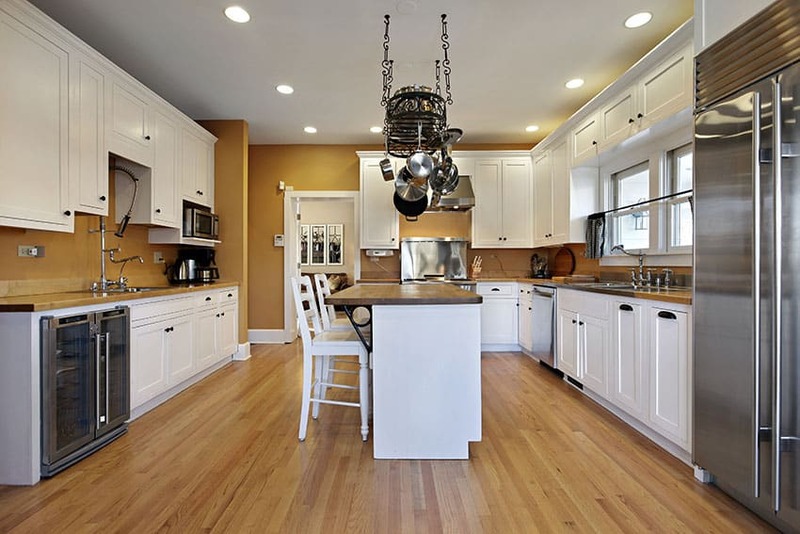 In the picture above white shaker cabinets match the kitchen range surround and the base of the butcher block kitchen island of the space. The black granite counter tops of the main kitchen counters, as well as the varnished wooden floorboards and tan-colored kitchen walls, are nice contrasts to the lightness of the white in the room. The design also makes use of usually unused vertical space by employing a hanging type storage for the kitchen’s pots and pans. 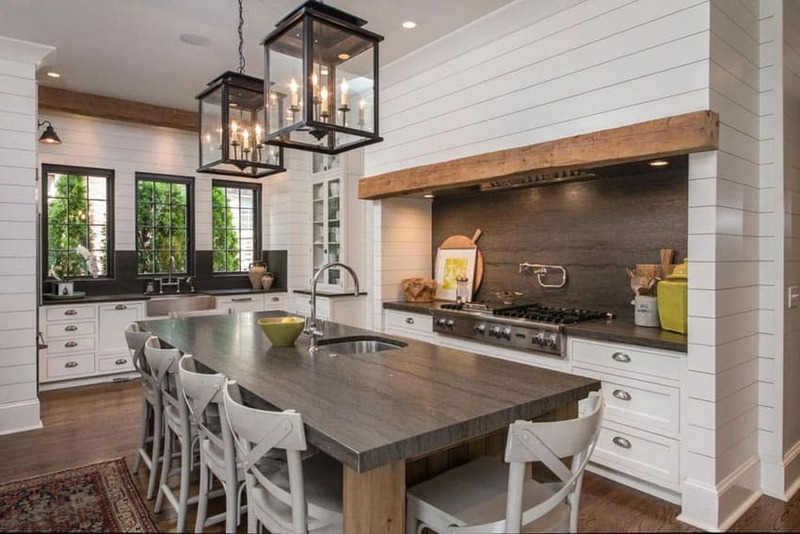 Country Kitchen designs often use white for its main walls and cabinets, with warm wood accents for some surfaces and cabinets. It also may use a particular stone finish for countertops, and a nice, quaint tile for its backsplash. Kitchen islands – These islands come in different shapes and sizes, but mostly serve as a breakfast nook. Sometimes irregularly-shaped to allow for more flexibility, or sometimes two-tiered to allow both dining and kitchen tasks. Butcherblock Countertops – These wood countertops come in thin strips of wood running linear over a long surface. The butcherblock wood finish gives a rustic country vibe, similar to those found in older barnhouses. Modern touches such as laminate paneling or space for electrical outlets may be integrated into the design. Handcrafted furniture – Barstools for kitchen island benches are usually a combination of either dark wood and leather upholstery or black wrought iron and reclaimed wood. Either way, they provide a rustic country look mixed with old town comfort. Backsplash – The backsplash in most kitchens uses a quaint country style tile in small cuts. The backsplash over the stove top is usually bounded by a linear border and then laid out in a diagonal fashion. The tile may also be completely different from the rest of the backsplash, serving as an accent. Exaggerated range hood – Country style kitchens often exaggerate the space above their rangehood. Designers do this by using a completely different material for the range hood cover such as reclaimed wood or rusted brass or bronze. Other kitchens are designed such that the architrave before the rangehood features a similar paneling and color to the hanging cabinets, but feature intricate fretwork on the arched detail. Wood floors – A good contrast to the typically white paneled cabinets, wood floors in warm colors are good to use in country style kitchens, especially because of the warmth it brings to the kitchen. These wood floors can be laid out in planks, strips or parquet tiles. An unvarnished natural look is best suited for rustic country kitchens. Pot hangers – A clear expression of old barnyard-style utility, these pot hangers are hung from the ceiling and are usually made of wrought iron or cast iron. Heavy pots and pans are hung here, and the setup of hanging materials can also influence the aesthetic of the kitchen. 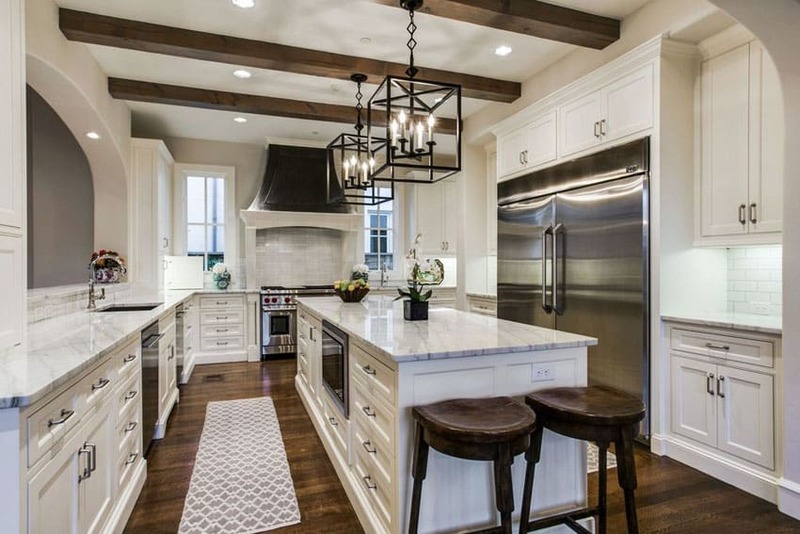 Beadboard and Exposed beam ceilings – Sometimes even in high-ceiling cathedral roofs, exposed beams in reclaimed wood are a great way to frame beadboard ceilings. Besides the height of cathedral ceilings being similar to the high-roofed barn houses in the country, the natural treatment of the wood as well as the quaint lines and nails of the beadboard ceiling also call back to a simpler construction style. Beams can even be constructed to have a truss-like appearance. Clerestory windows – Along with high cathedral ceilings are clerestory windows, openings way above the top of the kitchen’s hanging cabinets. These horizontal windows bring in light and do away with stale warm air. Glass-paneled cabinets – For lower-height ceilings, an imitation of these clerestory windows are the glass-paneled hanging cabinets or glass-paneled mini-cabinets above the main hanging cabinet storage units. 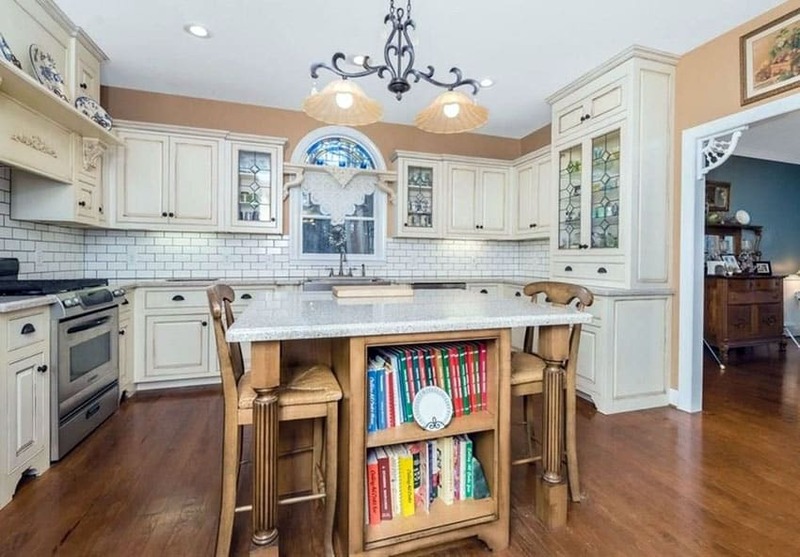 Usually in white mullions with a pane of glass in between, these serve as both storage and display, especially since a small pinlight is placed inside illuminating layers of glass shelves and acting as a sort of “window” for the country style kitchen. 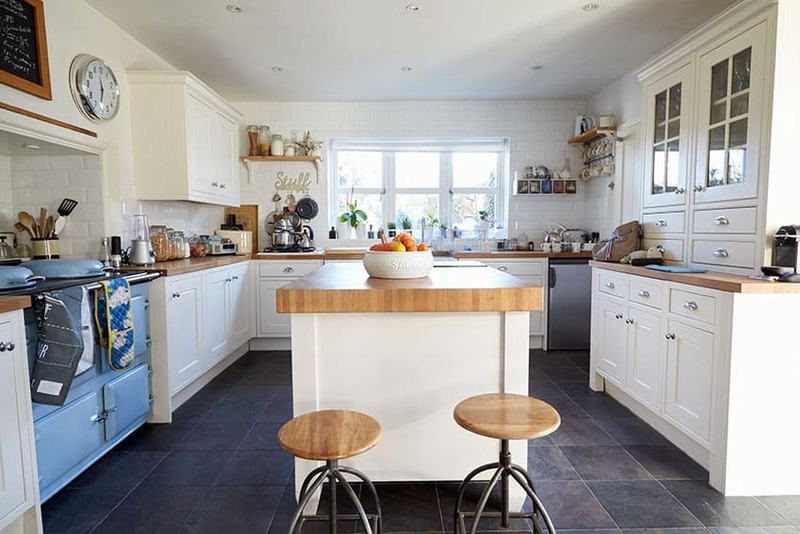 This country kitchen has a base of white in its color palette – the walls, flat panel cabinets and kitchen drawers. An array of different colors is used in the room as well. The rich dark wood used for the floors is a nice contrast to the lightness of the walls, the black granite counter tops are stylish additions as well. The subdued olive and yellow tones of the display cabinets are subtle hints of color that really brighten up the room. Country kitchen usually get their charm from the use of homey and warm design elements and materials. In this example, we get a taste of pristine white french panel cabinets, subtle but bold black cabinet hardware used on the white drawers and under-counter storage space, and the warm maple wood counter tops coupled with the white solid surface counter top for the main sink area. The sink is a farmhouse kitchen lavatory that goes with the whole cabin feel of the area. On top of the range and kitchen island, we have brass pipes that are used as a hanging storage space for the pots and pans. A flair of personality can undoubtedly be felt in this space. The playful colors of the counter top, country decor, the bowls displayed through the glass-panel overhead cabinets, and the use of plants and fruit to adorn the wooden counter island – these all contribute to the uniqueness of this room. A slight industrial feel can also be seen with the chrome lamp nickel plated pendant lights. This luxury white kitchen is equipped with pristine shaker cabinets with the same shade of white as the rest of the walls and ceiling. 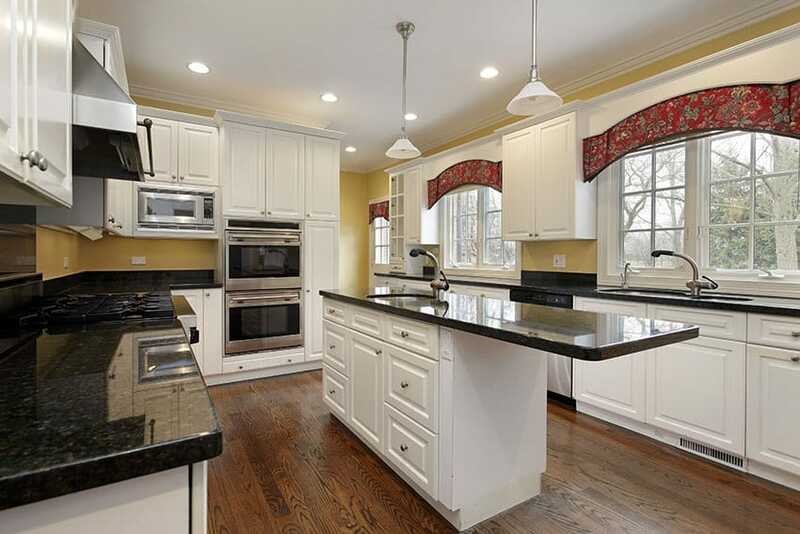 The marble counter tops of the kitchen counters are a stark dark color in contrast with the rest of the room. This goes double for the dark oak floorboards and the Tolix bar stools. The room also has stylish fixtures and finishes in the form of the pendant lighting, the custom range hood, and the subway tile back splash. Traditional and minimal, this example uses an almost strikingly bare style of design to keep the place feeling open and uncluttered. The use of white in the subway tile back splashes, the single-hung white french windows, the white kitchen cabinets and drawers, and even the Calacatta Carrara marble counter really make this place even more bright. We have hints of rustic charm in the wooden kitchen range surround, the heavily-grained wooden floors, and the ceramic farmhouse kitchen sink. 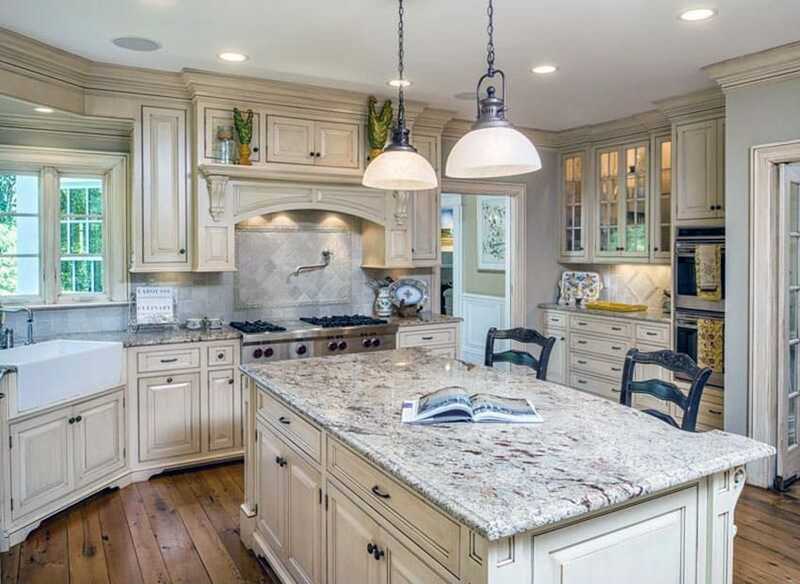 A more subdued and warm shade of ivory is used in this kitchen design. The breakfast bar peninsula is a nice space-saving workaround for such a small room. 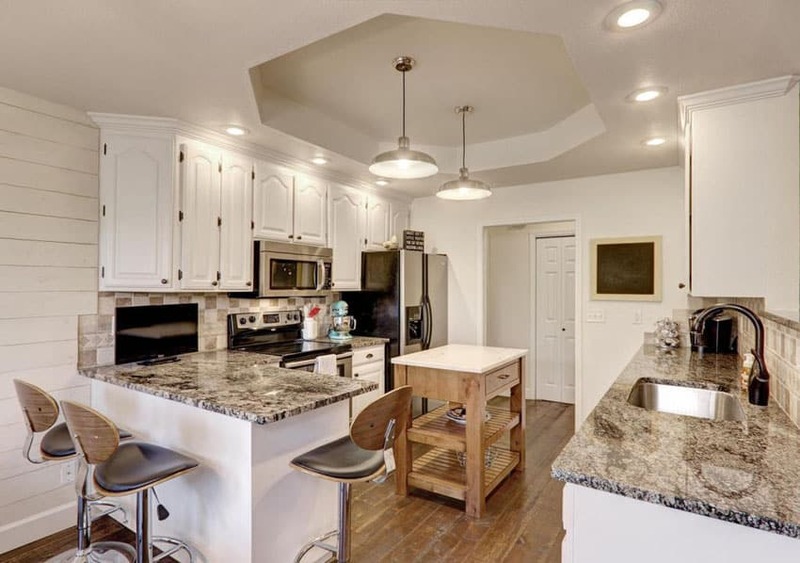 The brown and white checkered tile back splash has colors that match the Copenhagen granite counter tops. In the center, we have a movable wood island that still keeps the room flexible but gives some much appreciated counter space. White country kitchens can be combined with other colors to enhance the ambiance and feel of a space. Gold and white really go well together in contemporary kitchen and home design. 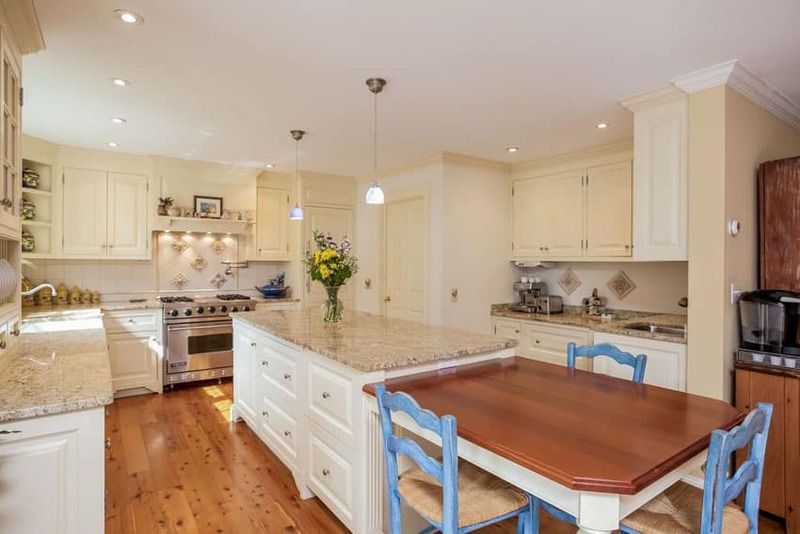 The butcher block counters have striking maple wood tones that co with the warmth of the wooden floor boards as well as the painted tan of the kitchen walls. The hanging pots and pans above the kitchen island are in storage but also serve as nice decors for the space. A beautiful peace of modern country kitchen design – the white cabinetry really make the space, while the hidden french door refrigerator is a less explicit way to do luxury design. The vinyl plank floors are durable and are in different tones of gray, black, and beige. The breakfast bar island is in a quite sophisticated state in its wooden island base and matching leather bar stools. 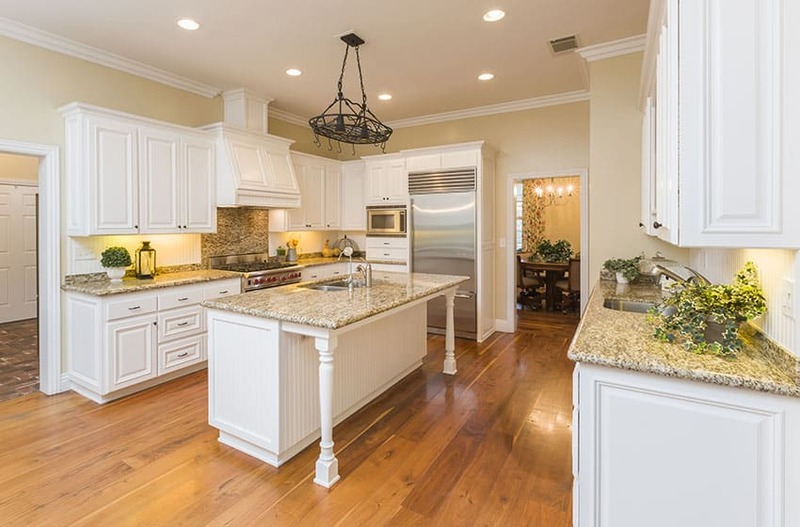 This beautiful and bright white country style kitchen uses a yellow granite counter that not only goes with the pure, white motif of the the cabinets, drawers, and ceiling, but also matches the warm browns of the wooden floor boards. The island is equipped with a kitchen sink and a small area that might double as a breakfast bar. The use of potted plants really give the room some freshness as well. 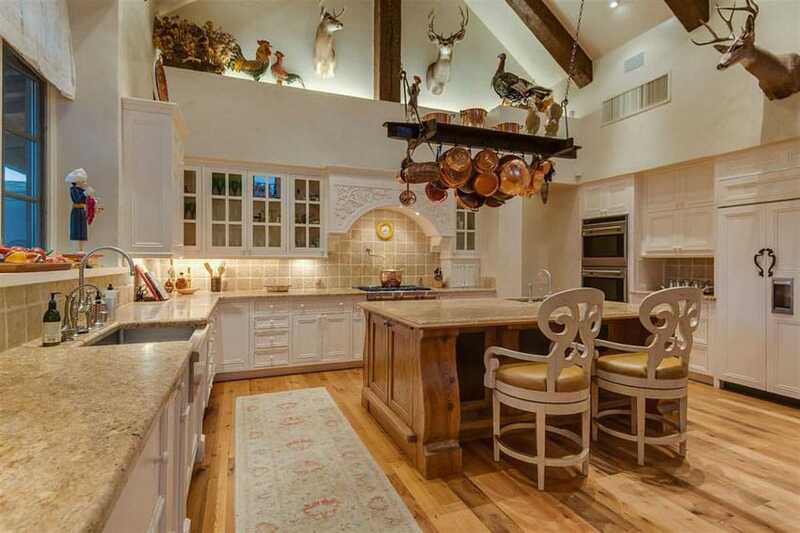 Here we have a more eclectic but equally as stylish example of rustic country kitchen design. 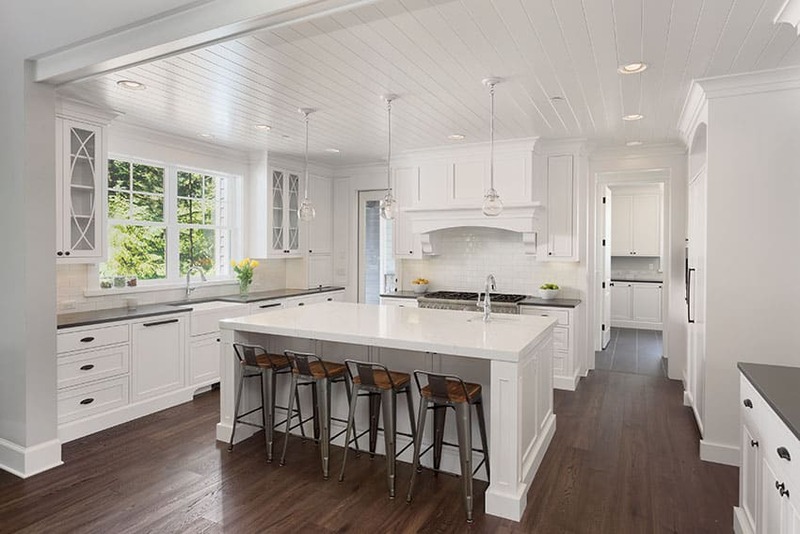 The beadboard cabinets are unique and match the ashen gray palette of the sloped ceiling and walls. The two-level breakfast bar island are made of the same wood as the cabinets have handy side storage spaces for books and magazines. The matching wrought-iron bar stools also have an endearing quality to them. The other design elements – the subway back splash, the stained glass window decor, and the top-of-the-line kitchen appliances – make this kitchen homey and special. The exposed beams of this country kitchen are made from a weathered and rustic wood that contrasts with the clean white nature of the painted walls and white cabinets. The wood used on the floors is more polished and finished in style but carries the same warmth as the exposed beams. The Blanco Tulum granite counters are a stylish choice for counter top and are matched by the different colored tiles used as the kitchen back splash. In the middle of it all, we have a blue painted kitchen island that can be used as a breakfast bar. 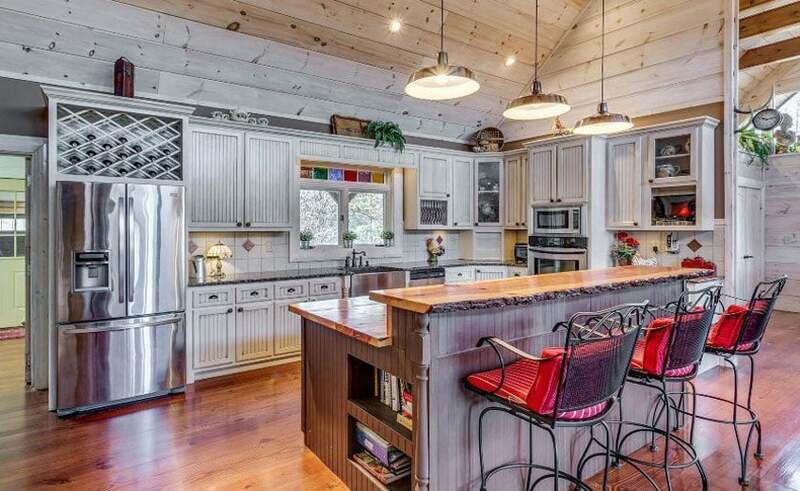 This country kitchen has a long island and a wood-counter breakfast bar attached to said long island. It has knotty wood floor whose imperfections only add to the charm of the designed space. The granite counter tops are of a brown and black speckled color that matches the tans and white of the cabinets and drawers. 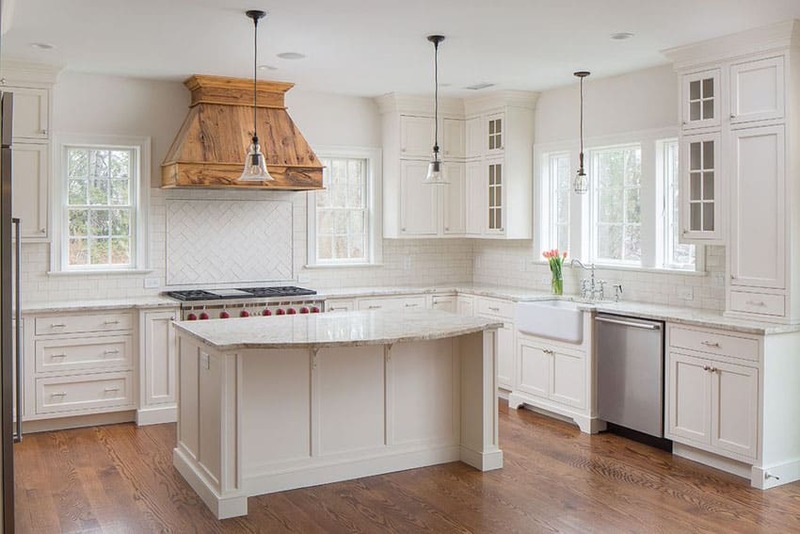 The off-white cabinets of this country kitchen serve as complementary bases to the Bianco Antico granite that is used on this residential kitchen design. Off to the side, we see a rustic farmhouse sink used alongside a 6-burner stove top and two high-end kitchen ovens. Porcelain counter top decors are used in this space with some hints of plantlife on an overhead shelf above the kitchen stove. This is one of the more spacious examples in this list. The vaulted ceiling in this example gives more than ample headroom for this country kitchen. This space is used for various stuffed animal trophies of deer and different avian game. 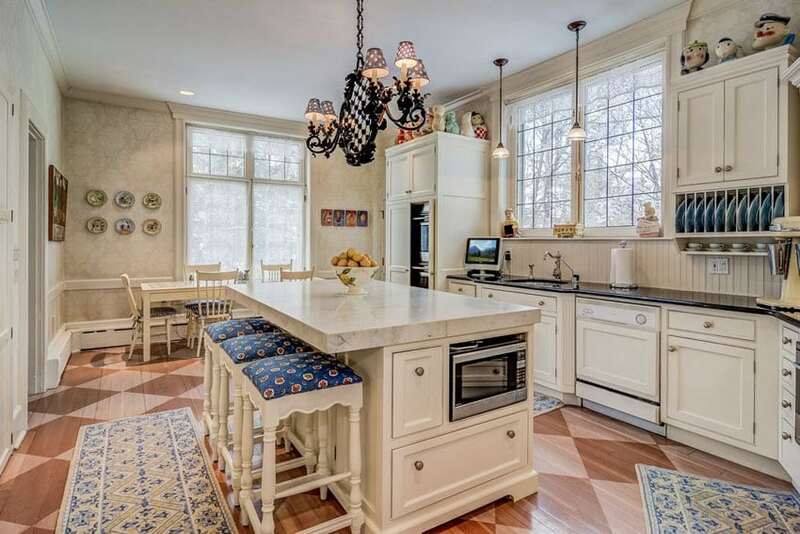 The hickory wood floors match the exposed roof rafters and the wooden carved kitchen island. Sienna beige granite counters are perfect for these types of rooms and the matching travertine wall tiles are also a nice design choice. One can rarely go wrong with white and navy blue color combinations such as the one used in this kitchen example. 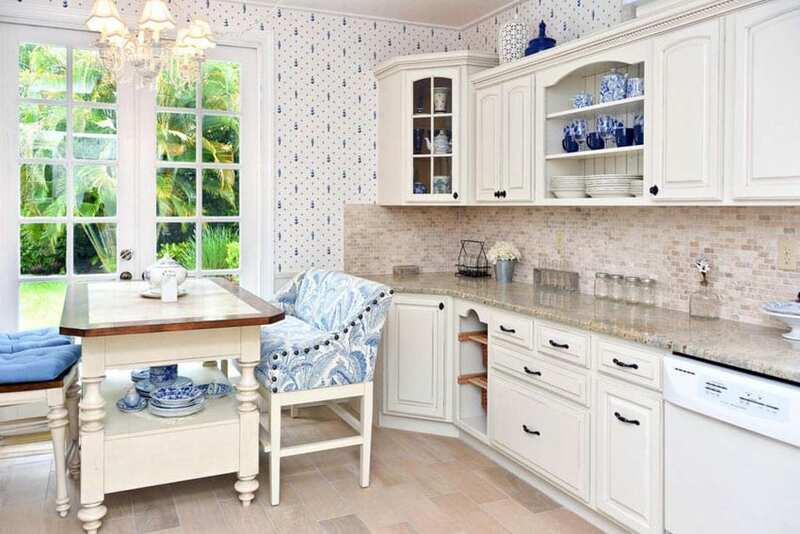 The white cabinets, drawers, and dining table set are all pleasantly complemented by the blue upholstery of the chair, the blue glasses and teapots displayed on the overhead shelves, and the blue details of the wallpaper used on the kitchen wall. The Cambridge white granite counter top matches the mosaic tile back splash and really complete the room’s aesthetic. Double-loaded designs such as this one maximize possible counter space and makes full use of narrow areas such as this kitchen. The white cabinets adorn most of the back wall, again a good example of maximizing available space. The farmhouse sink of the kitchen sits opposite to the Subzero-Wolf kitchen range. The marble counter tops are a nice combination of black and white and go with the room’s aesthetic. The wooden floorboards are also a nice dark contrast. The white European style cabinets used in this country kitchen design really go well with the rustic yet modern feel of the room. The ambiance is amplified even more by the glass box pendant lights hanging over the travertine counter island. The same material is used on the back splash of the kitchen range wall. A clever use of contrasting black, white, and brown can be seen with the white walls, dark counter tops and window frames, and wooden floors, range hood cover, and kitchen island legs. White raised panel cabinets evoke a more traditionally stylish feel in kitchens. This is further carried out by the patterned glass panels on some of these overhead cabinets. The wood center island of the kitchen functions as a cozy breakfast bar and has a clever built-in book storage to its side. The classic white subway tiles of the main kitchen counter go well with the browns of the floorboards. 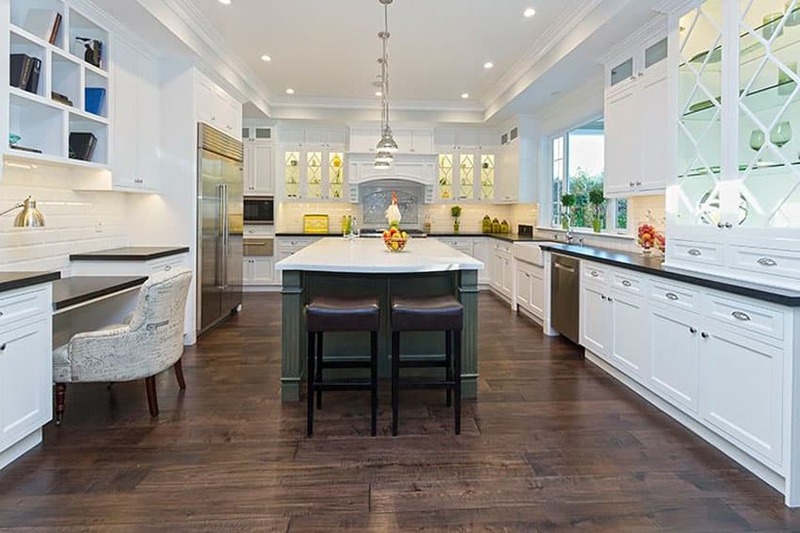 White shaker cabinets, as seen in this example, are standard go-to kitchen cabinet styles due to its simplicity and clean aesthetic. The kitchen island is topped off with Santorini white marble that contrasts the black solid surface kitchen counters. The bar stools of the island are upholstered with brown and blue cloth that really pops out in the subdued white and brown tones of the room. An interesting diamond checkered pattern is applied to the wooden floor boards of the room to further give the space personality. This country style kitchen design employs white kitchen cabinets and drawers contrasting with jet black granite counters. The island in the middle of this kitchen design has an overhanging cantilevered counter top made with the same black granite material. Two kitchen sinks are used in this design – one in the counter next to the windows, and another smaller secondary one on the kitchen island. Many white country kitchens have islands with seating to keep friends and family close by while preparing and cooking meals. 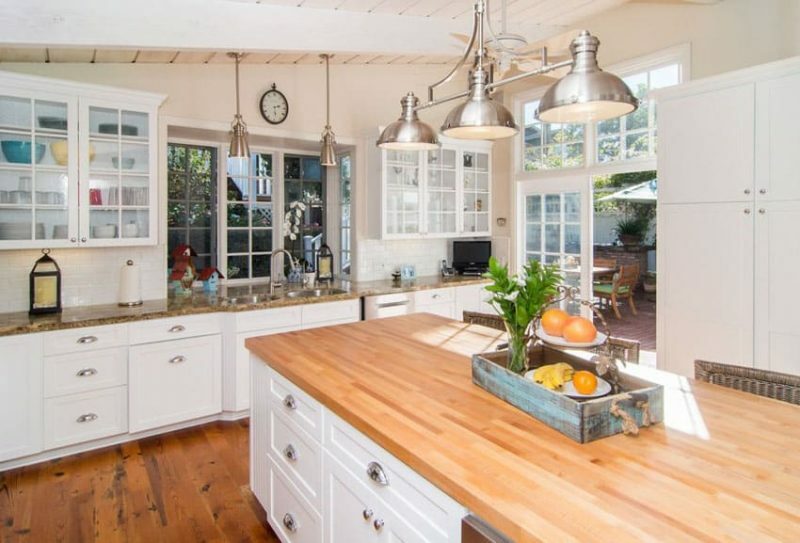 Butcher block islands and counter tops are good additions when a rustic, more homey ambiance is desired in a space. The wood of these counters adds warmth and life to the room. The sky blue vintage stove in this particular kitchen design is a good match for the room’s white and brown color palette. The coziness of this kitchen is further grounded by the black ceramic kitchen tiles used as flooring. 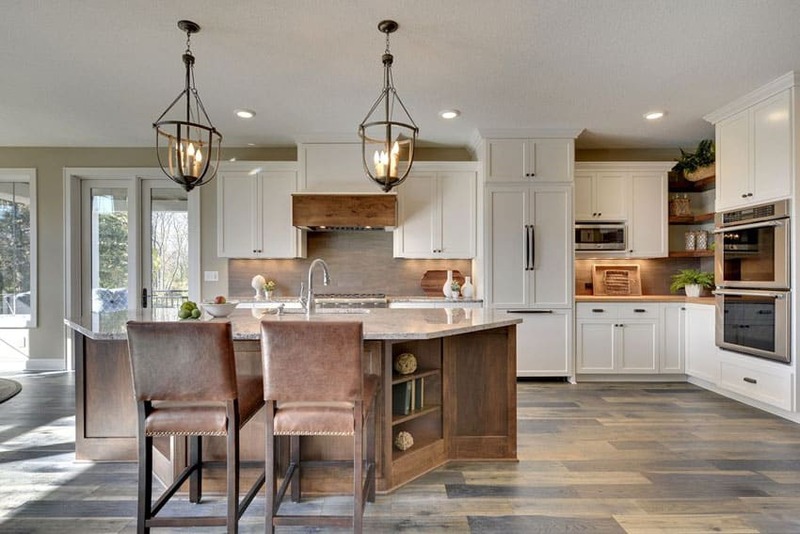 Cafe Creme natural stone granite counters, such as the ones used in this stylish kitchen, evoke a brightness and style that not a lot of materials can achieve. 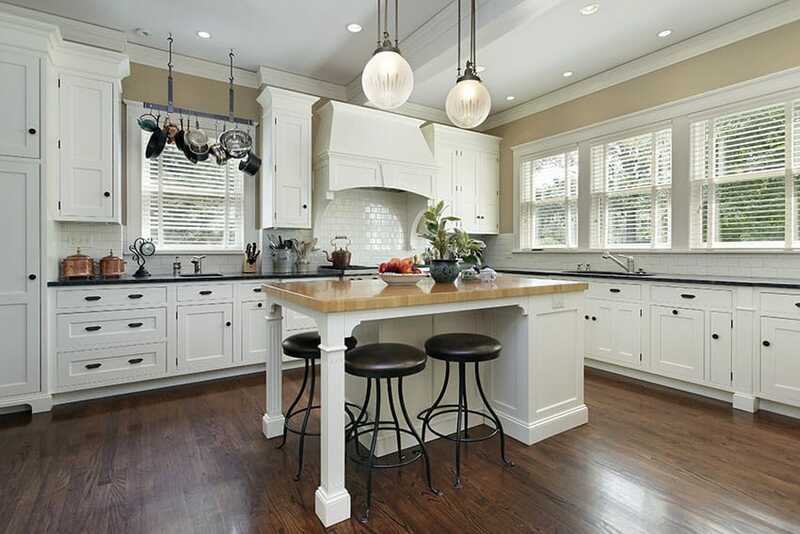 The kitchen also sports white cabinets and sidings seen also in the breakfast bar-kitchen island. 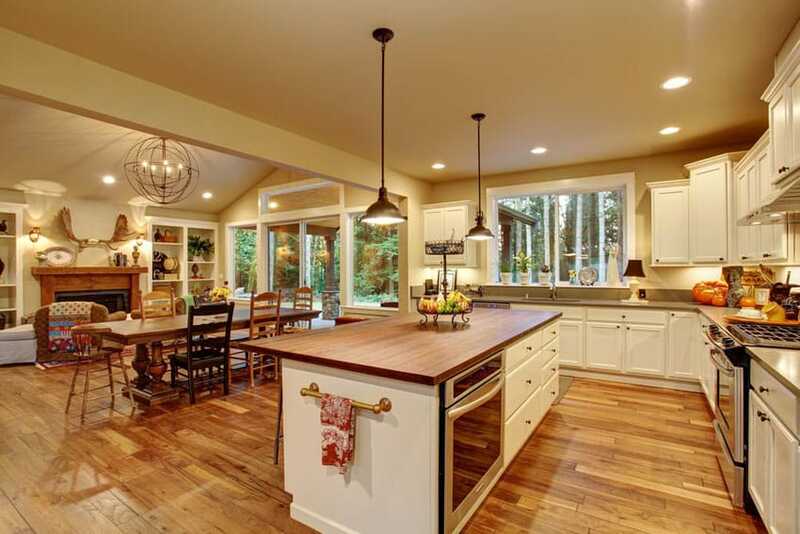 Dark Mazama hardwood floors were used to offset the brightness of the cabinetry. White country kitchens should be light and bright. 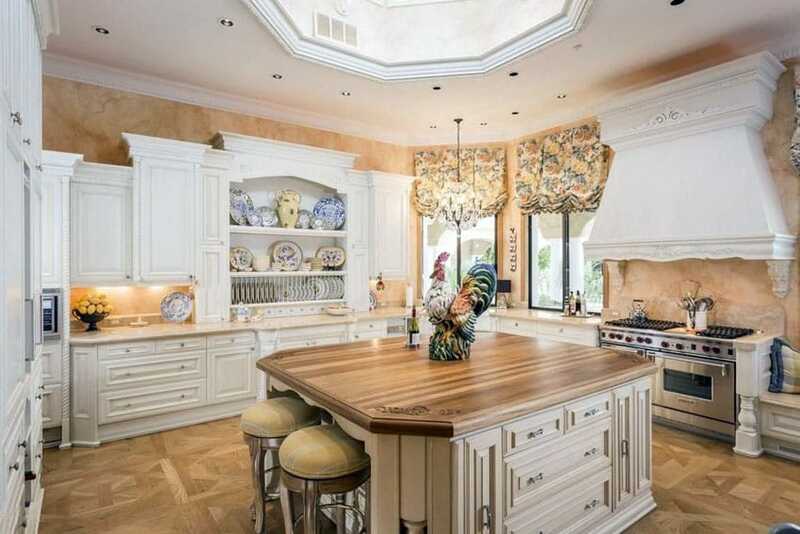 Nothing brightens up a room like natural light, and with this kitchen’s skylight cupola, it gets sunlight in spades. 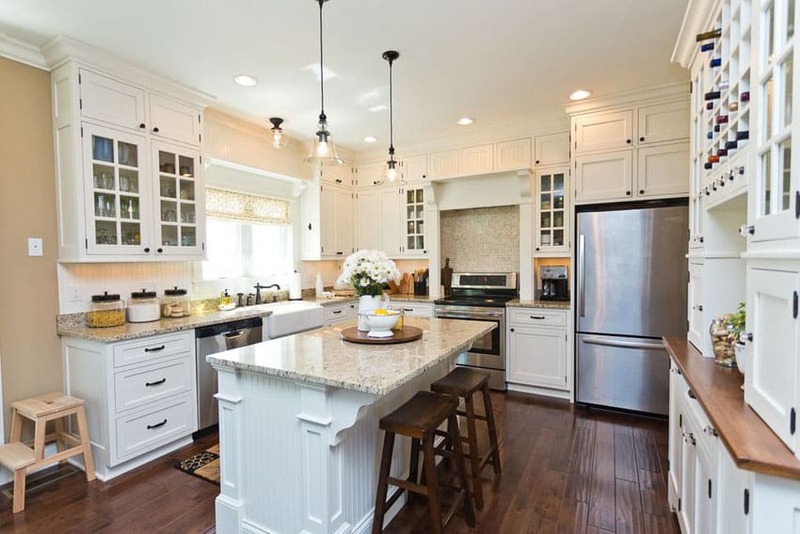 White decorative wood cabinetry is also used in this design, which evokes a very classy traditional feel. The wood counter island is stylishly done, with master-crafted engravings and different tones and visual variations in the wood. The wood parquet flooring is also a very stylish touch, and goes with the faint Victorian aesthetic of this space. This traditional cabin kitchen uses white cabinetry, heavily-grained cherry wood floor planks, and warm white and soft lighting to really give the space warmth. 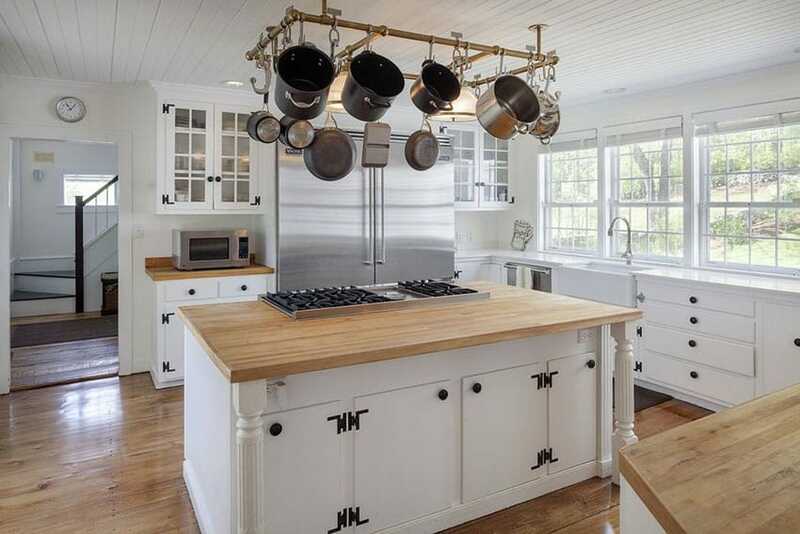 The butcher block island holds the kitchen’s main oven and can be used as a breakfast bar as well. An open layout such as this ones combines the openness of two rooms – in this case, the kitchen and the living room – to really make the space bright and airy. 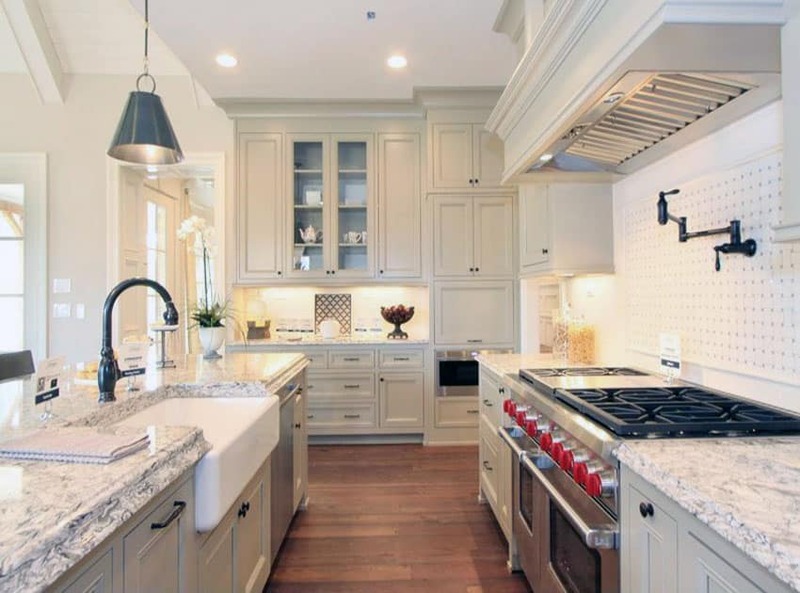 This luxury kitchen design uses its white-color motif in creative and stylish ways. The cabinetry, appropriately painted white, are topped by Arabescato statuary marble counters that have soft gray veins on a pristine white base. The oak wood floors are as richly varnished and stained as the matching wood bar stools for the central kitchen island. Black wrought iron lamps are hung right above the island and add a nice touch of vintage industrialism into the space.